Visitors are welcome to enjoy the serenity and ambiance Oysterville has to offer. The church is open year round and you are welcome to come inside explore and sit among the pews listening for reverberations of hymns sung by villagers for over a hundred years. After your visit, we invite you to sign the church guestbook and help yourself to a Walking Tour brochure. All donations in the church “poor box” support the maintenance of this historical landmark and are greatly appreciated. There are also other ways to support ORF. The Walking Tour is an excellent guide through the interesting spots in Oysterville. The lanes, marked Clay Street, Merchant Street, and Division make for an idyllic stroll through Oysterville and provide lovely views of Willapa Bay and the home fronts, as most homes along Territory Road face the bay. The Oysterville Schoolhouse is the best location for starting your Oysterville tour. Please park in the gravel lot. The schoolhouse and grounds are publically owned. You are welcome to look in the windows and play in the schoolyard, just as children did a hundred years ago. If the school parking lot is full, you may parallel park along any of the paved roads. You may also parallel park in the grassy lanes, denoted by street signs. Please do not block the lanes, as these are county roads. We also ask that you refrain from driving down the lanes to the bay as the ruts make the lanes difficult to mow and maintain. 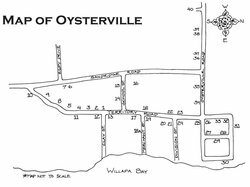 Oysterville is a community of privately owned homes, and while visitors are welcome to enter the church and peek through the windows of the school, please respect the privately owned properties and stay on the street side of the picket fences. There are two businesses in Oysterville. The cannery building is the home of Oysterville Sea Farms run by Dan Driscoll. Although no longer a cannery, OSF sells fresh oysters, steamer clams straight from the bay. Store hours and more information can be found on their website at www.willabay.com. On your tour be sure to stop at the oldest continually running post office in Washington state, established 1858. Althought the Post Office was run from private homes and once even a saloon, it eventually found a permanent home on the west end of the general store that was established 1919. Today the Oysterville Store has a wonderful collection of food items, prints of works by local artists and much more. More information can be found on the Oysterville Store Facebook page. The church has a year round outhouse located a short walk through the churchyard to the back of the building. During the summer, two porta-potties are located near the schoolhouse.